Chiricahua Pine White (Neophasia terlooii) butterflies are found in high elevation pine forests in southeastern Arizona and Mexico. To make things confusing, some sources classify these butterflies as Neophasia terlootii (note the added "t"), and they are also commonly called Mexican Pine White or Chiricahua White butterflies. 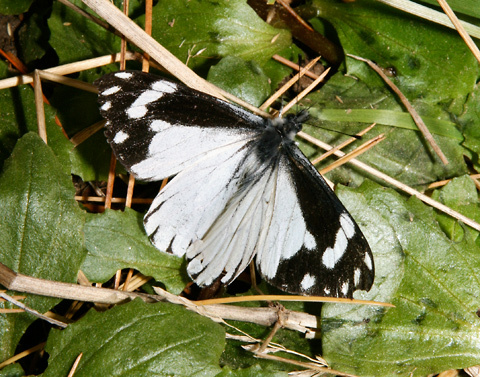 These butterflies are usually found above 6234 feet (1900 m) in elevation and are most common in the fall. It was late October when I observed this male Chiricahua Pine White in Bear Canyon in Arizona's Santa Catalina Mountains. Male Chiricahua Pine White butterflies are back and white, while the similarly marked females are varying shades of orange instead of white and have broad, black veins on the hindwings. 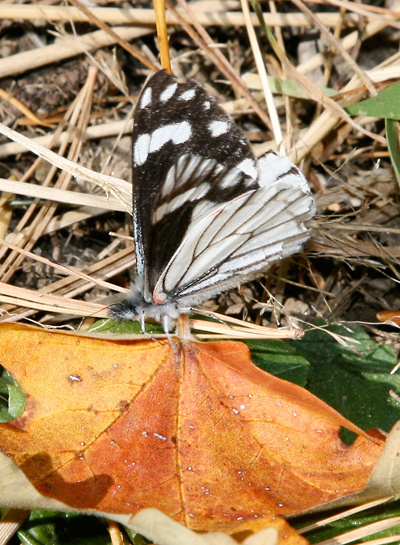 The ventral hindwings of the males only have very slender black veins. Chiricahua Pine White butterflies are lazy, erratic fliers and are often content to let the breeze blow them around as they occasionally flap their wings. This butterfly was blown out of the trees and ended up on the ground near my feet. I had thought that there was something wrong with him given his weak, aimless flight, but when I approached too closely while photographing him, he mustered enough energy to fly away quite normally. Male Chiricahua Pine Whites typically spend their days patrolling for females around the larval host trees. The caterpillars live communally in a silken tent and emerge at night to feed on the leaves of Arizona pines (Pinus arizonica), Ponderosa Pines (Pinus ponderosa), and Engelmann Spruce (Picea engelmannii).